In the rebuild "Kasten", on approximately 1,000 square meters, the industrial development of the City of Dingolfing is shown. From the seeders to the first-class automobile - the development line at the museum with the history of the companies Glas, Eicher and BMW. A history which is only possible to demonstrate in Dingolfing, at the origin. Exhibits, which show the lane of industrialization, are emphasis of this part of the museum. The beginning of the industrialization in Dingolfing is intimately connected with the company Glas. They founded their first establishment in 1905 and shifted the whole company of seeder - manifacturing in 1908 to Dingolfing. 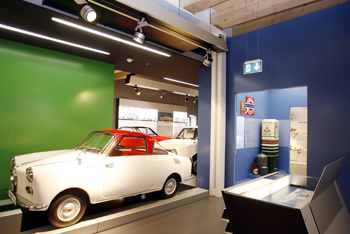 The museum documents the story of success of the Lower Bavarian company Glas by the time when BMW AG decided to take them over and to expand this location in 1966. Due to this fact, Dingolfing experienced an enormous growth. About 20,000 employees make Dingolfing the biggest factory location of BMW AG and at the same time the biggest industrial location in Lower Bavaria.